Stepping into the New Deal Fish Market in East Cambridge always makes me smile. Whole Foods might have good quality fish, but do they greet me by name? Do they remember which fish I bought last week? Do they take care scaling and gutting my fish as if they were going to cook it themselves? 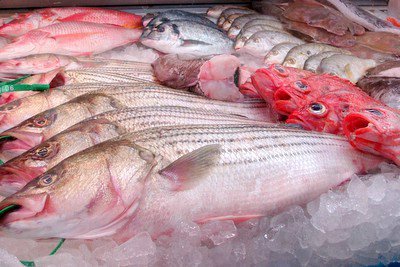 That’s why I love the New Deal Fish Market – they treat every customer like family, they educate people about fish, and they take pride in what they do. Carl is the third generation owner, who quit his engineering job to continue his family’s business. If you need advice on how to cook any fish, just ask Carl. He’ll even give you his mother’s recipes from their family’s home town of Gaeta, Italy. His father, Sal is a walking encyclopedia of fish. First he asks you where you are from. Then he gives you a tour of the fish counter in YOUR language (Italian, French, Spanish, Portuguese, Japanese). You should see him fillet! In this age of prepackaged fish soaked in preservatives, it’s refreshing to see the New Deal’s fish counter packed with whole fish. Although you can have any fish filleted to order, I just can’t resist the chance to get a nice little fish that I can cook whole. It’s no extra work for me, since Carl or Sal will clean it for me, and the fish tastes so much juicier and more tender cooked on the bone. This weekend I got a couple of Sea Breams (also known as Dorade in French, Dorado in Spanish, and Orata in Italian). Stay tuned for the recipe. Sounds like a fish market where I'd LOVE to shop! It is a very nice fish market. I have been buying all kind of sushi grad fish and seafood there since 2000. Never had a single problem. Carl is a great guy (you should try his recipes). His parents are also lovely people. Add Turkish to his fish vocabulary as well! This is "the" place to get fresh, whole fish! it's the only place i go. stop in and ask Carl what he recommends. I generally pick up some oysters, and some sashimi grade tuna (they have the most beautiful tuna, I can't resist), bream, salmon, fluke, or whatever he recommends. my #1 pick in boston/cambridge, such a great store! i went to New Deal for the first time last night after reading about it on your blog. Thanks for the tip! i bought literally the best piece of halibut i have ever eaten in my life. it was fresh fresh fresh! the place is personable, friendly and clean. two thumbs up. My wife and I go to "Carl's" every week. I grew up on an island in the Atlantic and Carl's fish is fresher than what I used to get at home. A flounder we bought started flopping. The best freshness. I just spoke to Carl and he's fantastic! I'm adding this store to my favorites, for sure! Oh my gosh! How lucky am I? When I first stumbled upon one of your posts about parasitic worms and heard you rave about New Deal I just assumed you were in San Francisco or anywhere else but here. But you're in Boston! Woo-hoo! I can't believe I people are talking more about this place on Chowhound! I worked in an excellent sushi restaurant for 3 years and have been missing sushi-grade fish worth getting excited about. I think its time to plan a sushi night.... !! Oh yummayummayummy! Eeeeeeee!!! I doubt they ship anywhere, but you can call and ask.